2011 Recruiting Board lives here. Michigan adds another commit to the 2011 class. 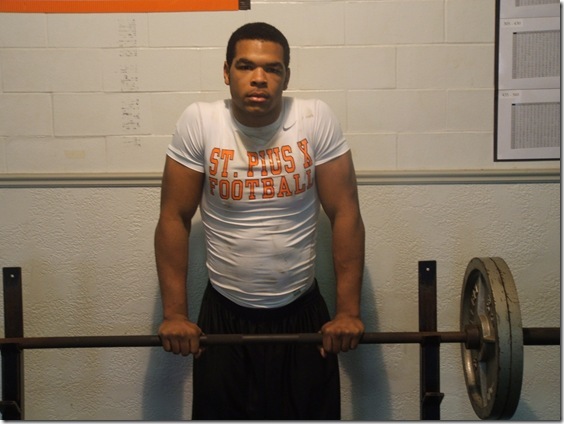 This time its Houston, TX linebacker Kellen Jones (6-1, 209). Jones' offer list is one of the longest and most diverse I've seen this year. He had offers everywhere from Boise State to Vanderbilt to Purdue to Arizona. Among the other standout offers that Michigan beat out...Stanford, Texas A&M, Illinois, Arkansas, Colorado, Missouri and Virginia. This is a great addition to the 2011 class. His abilities could be utilized sooner rather than later with Obi Ezeh and Jonas Mouton both in their final seasons with the Wolverines. Judging from the picture above...he could have a huge impact on this team very early in his career. Go Blue...keep those defensive monsters coming!